A new paper in Science solidifies the case for migration as the cause for the diffusion of agriculture in Europe. Discontinuity between early Neolithic farmers and Mesolithic foragers in Central Europe had provided strong hints about this discontinuity, and these were confirmed by other ancient European DNA, e.g., from Treilles, or the Tyrolean Iceman. The case now appears irrefutable, that people not ideas were involved in the spread farming to the northern fringes of Europe. If we were to ever find signs of acculturation, the north-eastern corner of Europe may be best place to look for it. Agriculture arrived late to Scandinavia and the Baltic, so there was maximum opportunity for Neolithic groups in the area to acquire pre-Neolithic genes from acculturated farmers during their ~2ky long journey from the Aegean. Conversely, forager populations persisted here longer than elsewhere in Europe, both due to the remoteness of the area and the relative unsuitability of the Neolithic package brought from more southern latitudes. During the Neolithic period there still existed foragers in Scandinavia who belonged to the Pitted Ware (PWC) culture. These have been the object of a previous mtDNA study, which found them to be strongly differentiated from contemporaneous Funnel Beaker or Trichterbecherkultur (TRB) farmers. The latter were farmers who were also associated with Megalithic monuments in northern Europe. This farming spread must have been by boat. There were no native aurochs on Zealand (Aaris-Sorensen 1980), so the early cattle at Akonge were definitely imported. Farther north, agriculture was probably carried by boat up the coasts, an easier method of travel than overland (see above). Baltic crossings would require longer open-water voyages than in the Cardial or LBK. Irish curraghs can, however, make substantial voyages and weather considerable seas (Hornell 1938, sec. 5:17–21), and a large one has even crossed the Atlantic (Severin 1978). The agricultural arrival in southern Scandinavia thus appears sharp. Gradualist views of Late Mesolithic developments can be discounted despite the spread of shoe-last axes beyond the farming frontier. Western Norway presents a similar pattern: axes and ceramics were in circulation for over a millennium beyond the farming boundary. This was the dusk of the European foragers: whatever their contribution to subsequent European populations, their way of life would soon give way to that of the farmer and shepherd. The Pitted Ware culture can indeed be seen as their "last stand", the last time in prehistory when they could co-exist on fairly equal terms with their farmer neighbors. The Neolithic farmer sample ('Gok4') was excavated from a megalithic burial structure in Gokhem parish, Sweden, and has been directly 14C-dated to 4,921 ± 50 calibrated years BP (calBP), similar to the age (5,100-4,900 calBP) of the majority of other finds in the area (15). There were no indications from the burial context suggesting that Gok4 was different from other TRB individuals (15, 16), and strontium isotope analyses indicate that Gok4 was born less than 100 km from the megalithic structure, similar to all other analyzed TRB individuals from the area (17). The three Neolithic hunter-gatherer samples were excavated from burial grounds with single inhumation graves on the island of Gotland, Sweden, for which associated remains have been dated to 5300-4400 calBP (16). We must keep in mind that a limited amount of DNA sequence was extracted, which corresponds to a few tens of thousands of SNPs in common with the best modern SNP set used; this corresponds to ~5% of the genome, with different success rates for the four sampled individuals. We must also not forget that these are farmers and foragers from a single point in space-time, and from the periphery of Europe, so we should be cautious in generalizing about the Neolithic transition in other parts of Europe. Regardless of the underlying model, our study provides direct genomic evidence of stratification between Neolithic cultural groups separated by less than 400 km, differentiation which encapsulates the extremes of modern-day Europe, and appears to have been largely intact for ~1,000 years after the arrival of agriculture. So, it appears that these individuals lived at roughly the same time and within a small area of Europe, and yet they are as different from each other as the most distant current European populations are. These were not simply drawn from the same or similar populations, some of them deciding to take up farming while others to practice fishing and hunting. These were different populations who maintained their distinctiveness long after "first contact". Two models have dominated European prehistory in recent decades: acculturationists claimed that the Neolithic package of domesticated plants and animals was transmitted across the continent while the people largely stayed put, while demic diffusionists claimed that people did move, but -at least in the most popular version of the model- that they gradually intermarried with local hunter-gatherers, forming a genetic cline of ancestry, at the far end of which the farmers were mostly derived from local foragers. One could very well say that the acculturationist model views prehistoric people as smart folk with no legs, apparently ready to take up a good new idea, but reluctant to leave their birthplace. The demic diffusionist model, on the other hand, viewed them as mindless automata, moving across the landscape with little purpose, marrying who they met, and filling a continent in much the same way that gas molecules end up filling a room into which they are introduced. Both these models are now revealed to be wrong: rather, it seems that "leapfrog" colonization may be responsible for the spread of agriculture and its associated technologies (such as Megalithism) across Europe. In this model, farmers lept from place to place across the landscape intentionally, preserving their gene pool and largely ignoring the pre-existing foragers of the landscape. Of course, farmer and hunter eventually did mix, and hunting cultures became extinct. But, this was a process that seems to have been complete after 4,000 years BP. Acculturation did eventually happen, and agriculturalists did eventually diffuse to every corner of Europe. But, these are events that happened after the initial group(s) of pioneers had opened the frontier. In this respect, the colonization of Europe bears some resemblance to the settlement of the Americas by Europeans: it happened by leaps and bounds, and the early waves of explorers and pioneers may have opened the landscape but did not immediately fill it: this happened later as a result of demographic growth and new waves of migration, with the extant populations being differentially descended -in different proportions- from migrants and natives. To more closely investigate the genetic similarity of extant European populations (22, 24) to Neolithic humans, we determined for each SNP and each extant population the average frequency of the particular allele found in either the Neolithic hunter-gatherers or the Neolithic farmer (16). The Neolithic hunter-gatherers shared most alleles with Northern Europeans, and the lowest allele sharing was with populations from Southeastern Europe (Fig. 3A). In contrast, the Neolithic farmer shared the greatest fraction of alleles with Southeastern European populations (Cypriots and Greeks), and showed a pattern of decreasing genetic similarity for populations from the Northwest and Northeast extremes of Europe (Fig. 3B). Individuals from Turkey stand out by low levels of allele sharing with both Neolithic groups, possibly due to gene flow from outside of Europe, but all other European populations can roughly be represented as a cline where allele sharing with Neolithic hunter-gatherers is negatively correlated with allele sharing with Neolithic farmers (Fig. 3C). Panel C from the allele sharing figure (left) suggests why we should be cautious about trying to reconstruct European prehistory on the basis of a simple 2-way model of admixture between farmers and hunters. It is true that extant European populations do fall on a clear cline between them that is strongly significant (R=-0.58, p=0.0029). This means is that they are different to each other in the same ways that farmers/hunters were different from each other. But, this still leaves about 2/3 of the variance unexplained: this may be partly due to the "noise" added by the small number of SNPs, and partly by the contribution of other ancestral groups to extant variation. One of these groups may be the east Eurasian element which must contribute to the differentiation of Turks from Europeans. But, there were probably other West Eurasian elements not represented by the two Neolithic groups: the Mesolithic Pitted Ware individuals have been previously assigned predominantly to mtDNA haplogroup U, which forms a minority in extant Europeans; and a handful of Neolithic samples (LBK, Oetzi, Treilles) have failed to turn up any signs of the dominant R1 Y-haplogroup of extant Northern Europeans. There must be other actors to be revealed in the unfolding story of European origins. A strong hint for this can also be found in the quite unexpectedly low "TRB" allele sharing of groups from the Northwestern Balkans. This is quite unexpected, as the area is widely believed to be a conduit through which agriculture spread into Central Europe. It is also an area with world maxima of Y-haplogroup I, a lineage which may be a remnant of Paleolithic Europeans, and correspondingly low levels of haplogroups that appear to have arrived later into Europe. Another important point is that levels of allele sharing between these Neolithic individuals and modern Europeans is generally lower than between most pairs of modern European populations. This is, in part, expected, since the Neolithic specimens are separated by modern populations by ~5ky of evolution, but may also be due to the contribution of unsampled groups to the ancestry of the latter. We found that compared to a worldwide set of 1,638 individuals (21-23), all four Neolithic individuals clustered within European variation (Fig. S5). However, when focusing the analysis on 505 individuals of European and Levantine descent, the three Neolithic hunterg atherers appeared largely outside the distribution of the modern sample, but in the vicinity of Finnish and northern European individuals (Fig. 1A). In contrast, the Neolithic farmer clustered with southern Europeans, but was differentiated from Levantine individuals. This general pattern persisted for a geographically broader reference data set of 1,466 extant individuals of European ancestry (22, 24) (Fig. 1B), for a much larger number of markers from 241 individuals in the 1000 genomes project (25) (Fig. 1C), and using model-based clustering (26, 27) (Fig. 1D). Although all Neolithic individuals were excavated in Sweden, neither the Neolithic farmer nor the Neolithic hunter-gatherers appeared to cluster specifically within Swedish variation, a pattern that remained also for a larger sample of 1,525 individuals from across Sweden (28) (Fig. S9, Fig.S21-22). I will try to perform an analysis of these 4 Neolithic Europeans, as I did with the Iceman, and see how they relate to a larger number of populations: for example, the Mesolithic hunter-gatherers have the highest allele sharing with Poles: do they share even more with Lithuanians and other Baltic peoples? The Neolithic farmer is by far closer to Cypriots: are there any populations of the Near East that are close to it as well? In our genomic analyses, the Scandinavian Neolithic hunter-gatherers (PWC) have a genetic profile that is not fully represented by any sampled contemporary population (Fig. 1), and may thus constitute a gene pool that is no longer intact or that no longer exists. While the origin of the Neolithic hunter-gatherers is contentious, the similar mtDNA haplogroup composition of PWC individuals (8) (Table 1) and Mesolithic- and Paleolithic individuals (7, 29) indicate some continuity with earlier European populations, but resolving this hypothesis will require pre-Neolithic genomic data. 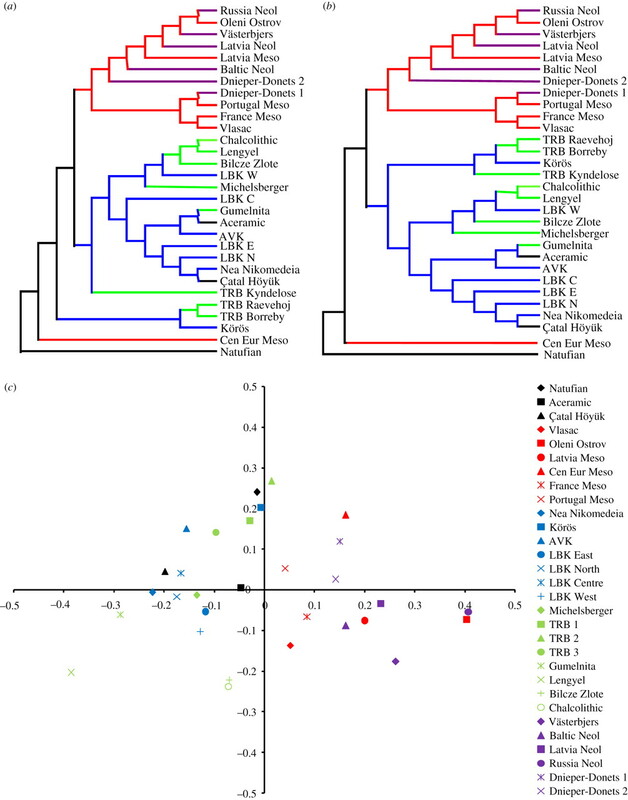 The continuity between Mesolithic and Neolithic hunter-gatherer populations in the Baltic is supported by craniometric analysis from a recent paper (left), but it is definitely worth investigating whether -despite their strong differentiation- the Neolithic farmers and foragers of Sweden may not have already started -at least partially- the process of amalgamation. Hopefully we can soon extract more DNA from other Neolithic Europeans, as well as pre-contact European foragers. It is probably in the Copper and Bronze Ages that we are to encounter some the remaining players that formed the European genetic landscape and witness how they all combined to form the proto-historical and recent Europeans. The paper is also discussed in the weekly Science podcast. The supplementary materials are freely available. After reading the review and analysing the graphs, I was under the impression the closest population to the Neolithic Swedish TRB was the Spanish/Basque population? Not only did the graphs portray this, but the study specifically differentiated between the South European population and the West Asian/Levantine one. Modern populations of Cyprus, Turkey, Greece..etc have West Asian affinities - and this is why the Neolithic TRB sample do not line up exactly and is a better fit to Spain/Basque. No, the highest allele sharing is with Cypriots (68.2%) and Greeks (67.94%). Table S10 contains a sorted list of populations. Spain is somewhere in the middle of the list. I assume that the "wider" writing was yours. If so, that was a spectacular analysis! The idea of *late* acculturation, low tbr similarity in the northeast balkans, and the acknowledging the need of "other" populations to explain variation all things most people wouldn't notice or explanation so well! The last report was a tease but now we know that the northern Europeans are closer to the neo h/g than the neo farmer (especially the latvians). I'm not persuaded by the appeal to table S12, Dienekes. It is true that the largest allele sharing (by not much: 67.32-68.21% is the range) is Cyprus. Next is Greece (67.94%) but the level is so similar to France (67.89%), the Netherlands (67.88%) or others that it is a bit force. In the Admixture analysis the Western Swedish Megalithic farmer falls near SW Europeans and so does in the PC analysis. This is consistent with the origin of Megalithism in SW Iberia (Southern half of Portugal and nearby border areas of Spain), soon after the formation of Neolithic there (with lots of mtDNA H mind you, enough to explain some stuff that really needs explanation in the late Prehistory of Europe). On the other hand Götland Island's Neolithic "foragers" fall much closer to modern Swedes and Eastern Europeans than your phrasing would suggest, rather indicating "forager" continuity, not in the farmer Megalithic individual but in the modern Swedish and generally Baltic population. [Note: Although these foragers are a bad proxy for true local Scandinavian Epipaleolithic peoples because they arrived from Russia an Ukraine not long before but whatever - after all the Dniepr-Don Neolithic, with lots of residual hunting, appears to be a native Epipaleolithic development with few external inputs]. I'm not persuaded by the appeal to table S12, Dienekes. It's not an "appeal", it's the raw data. Ok, so Sardinians are near 100% "Gok4", and the closest allele sharing is with Southeastern Europeans, but this indicates origin of Megalithism is Iberia... Right. "My phrasing" has nothing to do with anything. It will be interesting when we can compare this Swedish megalithic dna with samples from other megalithic sites in other parts of western Europe (including the western Mediterranean). My guess is that the most likely story is one of migration from the the eastern to the western Mediterranean, consolidation and development of new cultural forms there and then migration into the Iberian peninsula and northwards through southern France to the Atlantic and North Sea coasts. Don't you mean "Northwestern Balkans"? I think northern balkans would have been most appropriate. What is that Hungary? But even the northeast balkans doesn't have that much considering its neolithic. I think even more interesting data would result from sampling mesolithic Scandinavians like Skateholm and Vedbaek. They are the last hunter-gatherers i the region. There is a large time gap between them and GRK, whos dna could be influenced by their contacts across the Baltic. Sorry, GRK is Swedish for PWC. TRB started ~4,100BCE -- ~300 years before any indication of megalithism, and the first such indication was earthen mounds -- stone graves came yet another 300 years later. As such, there is no indication that a lot of people moved into the area with megalithism, but rather that it was adopted by the local TRB culture. That one itself appears like a local, at first western Baltic evolution form LBK (via Rössen) - just like pretty much everywhere around that time LBK had dissolved into regional cultures. So, my best bet is that these agriculturalist are the descendants of LBK, which themselves came from the Balkans. That appears to be also the best genetic match (and not Turkey or the Levant). So, my "local Balkan" origin hypothesis for central and northern European agriculturalists still stands. Now, keep in mind that "local Balkan" at that time may have also meant a much wider region (e.g., including parts of Italy - and even before agriculture - i.e. local HGs). We simply don't know at this point. BTW, if these people originated in Anatolia, wouldn't it be strange that they managed to conquer most of Europe, but are no longer present in Anatolia? Also, is there any neolithic archeological connection between Greece and Cyprus? From what I know there is little to Anatolia. I agree that PWC is at best a marginal proxy for Northern European HGs - probably a better proxy for far Northeast European HGs. So, there are still other HG populations to account for: NW Europeans and Iberians, for example -- which may explain the missing 1/3 match. 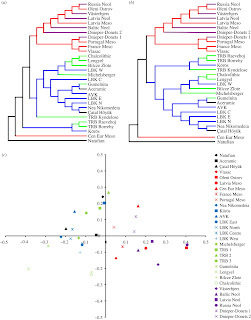 Interesting to see that both the farmer and HG samples show no "West Eurasian" component in Fig. 1D, and both are already somewhat admixed. BTW, the "white spot" in the Balkans in Fig. 3b is perhaps correlated with Slavic expansion into the area, if I2a1b1a* there is intrusive. The presence of mtDNA haplogroup V in the HG sample and H in the farmer is interesting. Except, where's Russia, and how come the East/North Finns are only in 7th spot? Allele sharing only makes sense with populations that don't have extraneous influences, because they are averages of the local and foreign element. That is why, for example, Turks appear so off-cline, because they are ~6% East Eurasian, and their allele sharing is a weighted average of the ~94% (that is probably on-cline) and the ~6% that has much lower allele sharing with both farmer and H/G groups. All in all, it would have been idea to use east Eurasian groups as controls; if we had data on the allele sharing baseline with such groups, then we could estimate allele sharing of the West Eurasian component in populations of mixed East/West Eurasian ancestry. The archaeological article is interesting as it suggests that pitted ware hunter gatherers ultimately took over most of the territory of the funnel beaker farmers. "Allele sharing only makes sense with populations that don't have extraneous influences, because they are averages of the local and foreign element. That is why, for example, Turks appear so off-cline, because they are ~6% East Eurasian, and their allele sharing is a weighted average of the ~94% (that is probably on-cline) and the ~6% that has much lower allele sharing with both farmer and H/G groups." Yeah, maybe, but that shouldn't affect the French or the Dutch, etc. I think the reason the Turks are so far down the list of the farmer is the high level of the so called Caucasus component in them, which is basically missing in Oetzi, the TRB woman, and in modern Sardinians. This is also the missing piece of the puzzle across much of Europe IMO. It seems the maritime Mediterranean farmers were quite different from Anatolian farmers, specifically in that they lacked what we call the Caucasus component. So a good question is, where did these Mediterranean farmers come from? The Levant prior to the expansion of Anatolian farmers? Or perhaps North Africa? We know where the Anatolian farmers came from, and they seemed to have affected much of Europe profoundly...except of course the Basques, Sardinians and also Balts, Finns, and even some Iberian groups. My bet is, the Anatolians were pre-proto-Indo Europeans. While the proto-Indo-Europeans were European Mesolithic hunters turned farmer, but also heavily mixed with Anatolians. If PIE was formed out of a synthesis of Anatolian farmer and Northern European Mesolithic hunter, as you suppose, then it would have come into existence after 5,000 years ago, because, at present European farmers of c. 5,000 years ago appear more akin to the Mediterranean than to the Caucasus. But, 5,000 years ago, PIE had already experienced its deepest splits. It cannot have come into existence by the proposed process of fusion, after it was already in existence and had begun its breakup. Moreover, it cannot have come into existence in much of the territory of Europe that seems to be quite "Mediterranean" in the Neolithic based on the available evidence, since the "Mediterranean" components seem to be particularly lacking in the eastern Indo-Europeans of Central and South Asia. The origin of Proto-Indo-European probably involved a relatively small West Asian group that arrived in northern Europe and Oetzi-land after 5,000 years ago, and is detected today by noting e.g., the difference between Basques and Indo-Europeans in Southwest Europe and Finns and Indo-Europeans in Northeast Europe, i.e., the two regions where non-Indo-European speakers survive. Compare this with the idea of reconstructing native americans from native-american-speaking populations: then Guarani-speaking paraguayans (50%-60% european) would be like your Finns or Basques. And spanish-speaking tobas (5% euro) would not be taken into account. The Scandinavian farmer sample is probably Mesolithic North European-admixed to a certain degree (she probably admixed on her way to Scandinavia), as extant Sardinians seem to be genetically more agriculturist and less hunter-gatherer than her. Proto-Indo-Europeans, if they lived in Anatolia, were probably genetically closest to Turks (minus their East Eurasian admixture) and Armenians among extant populations. Based on these presumptions, the Scandinavian farmer sample might be part of a South European-originated farmer migration wave rather than Anatolian, and Indo-Europeans might be part of an Anatolian-originated migration wave (albeit with a small genetic impact outside Anatolia and the nearby IE-speaking regions). i wish your knowledge be eternal...meaning Dienekes..
Until I get my hands on the Gok4 genome, I won't speculate on exactly what her genetic identity is. The allele sharing with the various European populations is interesting and gives a broad idea, but, unfortunately, it does not compare her to Near Eastern populations. Turks are quite inadequate for this purpose due to their east Eurasian admixture. We simply don't know why Gok4 matches Cypriots and Greeks so closely. I'd be surprised if it did not involve at least a big chunk of "Southern" based on the pattern of Gok4-related ancestry estimates in the paper, but we don't know at present what else might be there. Getting the data is quite cumbersome, but I'm hopeful I'll figure it out in the end. Dieneke, Turks are not the only West Asian population involved in this study. There are also Druze and Adyghe, and they too don't align with the Scandinavian farmer sample. It is obvious from the results that the Scandinavian farmer sample is part of a farmer migration wave that has most of its roots in Southern Europe (more from the western part rather than the eastern part, it seems) and not in West Asia (including Anatolia). BTW, allele sharing differences between the analyzed populations are not great, and PCA and ADMIXTURE analyses are much more informative about population relationships. Adygei are part North European and part Mongoloid, Druze are a quite idiosyncratic population with high levels of inbreeding. The point is that the relationship of Gok4 to modern populations depends on the makeup of these modern populations. We've had two locations in Europe where we got ancient DNA from, and in both cases the sampled individuals resembled peoples from "somewhere else". So, we should be careful in assuming that modern populations such as the Adygei and Druze are perfect representatives of prehistoric populations from the same regions. In any case, I seem to have perfected my pipeline for getting the Gok4 data, so -fingers crossed- I will be able to pinpoint her affinities more closely. The oldest practical evidence for a indo-european language is Hittite which is ~4000 years old since rik veda is "dated" to 1700-1100b.c. any claim of indo-european languages existence prior to 2000b.c. is evidently baseless. These were already well-differentiated languages that must have sprung from a common ancestor much earlier than their first attestation. So, there were in fact Indo-European languages prior to 2,000BC, unless they experienced superhuman levels of differentiation. As a prehistorian, I would say these are interesting results, but the press release (I haven't yet seen the article) and the commentary here are rather over-excited. There is very little reason to think that the TRB of 3000 BC is identical with that of 4100 BC, when the Neolithic begins in southern Sweden. For example, that period sees the introduction of new monument types, such as megalithic tombs, earthen long barrows and causewayed enclosures, introductions which could well have been accompanied by population movements from the more southerly parts of the TRB area such as Germany and the Netherlands. In other words, I don't think the genetic makeup of a single individual from over 1000 years after the transition to farming in southern Sweden can tell us anything much at all about the process of transition. That's part of the point. That they were so different after what was probably a long time. Dienekes-- which Turkish sample did you use in your analysis? Based on your Gok4 against K7 Southern regression (Gök4 = (1.721* Southern) + 19.736), I got 74, which does not seem to imply Turkish are so "off-cline". I'm DOD838 btw. Thanks! No Turkish sample was used to derive the regression equation of Gok4-related ancestry on "Southern" component, because this equation was based on the table of Gok4-related ancestry that did not include a Turkish data point. Turks are off-cline on the allele sharing. Thats a very suggestive point! But firstly, for the sake of logic reversely it can also be said that the reason of those differentiations were the result of arrival of Indo-european languages there from somwhere else! Which made it vivid cause as of presence of different groups there whom adopted the language differently! Like Hittite and older Hattians, the hittite has many non I.E. words too! Before 2000b.c. we have no clue but there is a Peacock motif found likely from 2100b.c. as shown by Bryant;-). Secondly, as we can see no genetical uniformity for Different I.E. Groups world wide with Y-DNA and Components! So according to you which Y-DNA/s and Component/s is or are the strongest candidate/s for representing the original P.I.E?. So according to you which Y-DNA/s and Component/s is or are the strongest candidate/s for representing the original P.I.E? But my question is what Dienekes suggests. I am not sure he believes there is such a thing. However, if one believes that in Europe IE started to spread with the neolithic, then G, or more specifically, G2a, is the only one that makes sense. Firstly, it is (and presumably) was highly available in the centers of agriculture around the Black See. Secondly, at one point in the early neolithic it was sufficiently dominant in Europe to make a language intrusion plausible. Thirdly, to this date it has the lowest concentrations in Europe in areas that either don't speak an IE language or adopted one very late: in Basques, Irish, Scandinavians in general but specifically in Saami and Finns, and also in Balts. Around the area where agriculture started, G2a is high today in Israel/Palestine, Jordan, Lebanon, Druze in Syria, Turkey, and Armenia. Then of course lots in the Caucasus, but intermixed with other Gs. Oh, I forgot to mention Iran, and of course also Pakistan and India further East. I believe G2a is everywhere there by far the most dominant G.
There's also G in the Tocharian region all the way to northern China, but I have no idea if that is dominated by G2a or has some Caucasus connection (other G). It would be very interesting to look at star plots/ the geographic distribution of all the sub-levels of G2a. I'm afraid to say as you do "That's part of the point. That they were so different after what was probably a long time" is rather misleading. The problem is that there is little evidence for "they" being two parts of a single population. The one TRB sample comes from western Sweden, in an area outside the PWC region. The three PWC samples come from Gotland, 90 kms to the East of Sweden and just 130 kms from Latvia. Thus it is quite possible that a) the populations of western Sweden and of Gotland were quite different in 4100 BC before the beginning of the Neolithic; b) that the PWC represents (at least partly) a movement into the western Baltic by seal-fishing and boar-hunting groups from the eastern Baltic after a period of agricultural economy on Gotland; c) the single Neolithic sample from western Sweden reflects population movement into the area at some time in the 1000 years after the introduction of agriculture there and before she was born. Any or all of these could well be the case, thus complicating things beyond a simplistic model of these results demonstrating that incoming farmers replacing gatherer-hunters in 4100 BC. Sorry but The main Y-DNA for Indo-aryas is R1a1a,R2a,H and some J2 but J2 is not significant at all for Brahmins. Clearly for simple sense you cant stamp a single Y-DNA family for the PIE. "The origin of Proto-Indo-European probably involved a relatively small West Asian group that arrived in northern Europe and Oetzi-land after 5,000 years ago..."
Are you arguing that the Indo-European Urheimat was in Eastern Europe, sort of around Hungary? The idea is plausible. "My bet is, the Anatolians were pre-proto-Indo Europeans. While the proto-Indo-Europeans were European Mesolithic hunters turned farmer, but also heavily mixed with Anatolians." shouldn't it be the case that the minoans / etrucscans are more likely to be the first farmers from anatolia? In which case the Anatolian farmers talked about on here might not have been the first farmers but the second. What if the first non-IE farmers expanded to the limits of the range where their agricultural package was viable. However beyond that range they also spawned a secondary range that used a reduced pastoralist version of their package i.e. sheep-herding. (The equivalent - or possibly even the ancestors - of the Gutians who later temporarily over-ran Sumer from what is now Kurdish terriotory. In this case the PIE would be the first pastoralists in the more mountainous terrain around the edge of the first farmer range rather than first farmers themselves. The sequence would then be the minoan-etruscan anatolians either expand west on their own (or get pushed west by the PIE) but in either case the PIE second farmers displace the first farmers in Anatolia and eventually catch up and displace them elsewhere along the same latitudes except in a few pockets like Basques, Sardinians etc. So basically the same theory but with a twist at the beginning with two layers of neolithic farmers, one non-IE and one PIE. I don't know how well that would fit.